Dabur India adopted and undertook infrastructure development of Sessa Panbari Lower Primary School in Tezpur. This development is part of Dabur’s commitment to improve the lives of local communities in Assam under its Corporate Social Responsibility (CSR) drive. Under this initiative, Dabur’s CSR arm Jivanti Welfare and Charitable Trust has completed renovation work in Sessa Panbari Lower Primary School, which included refurbishing the school building and classrooms; construction of a new boundary wall and entry gate; repair and construction of toilet blocks for children and teachers; and repair of school kitchen, among other things. Building as learning aid, or Bala paintings, were also undertaken to develop the school spaces like classrooms, walls, pillars and outdoor spaces as learning resources for students. To improve hygiene standards in the school, Dabur also distributed dust-bins. This is the second school in Tezpur to be adopted and renovated by Dabur India under their CSR programmes. Prior to this, Dabur had undertaken a major revamp of Dhekidol LP School, which included upgrading the classrooms and building, revamping the sanitation infrastructure for students besides construction of a concrete boundary wall. 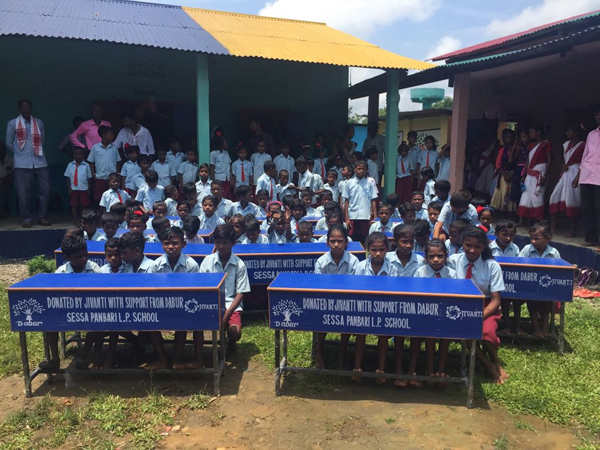 Dabur has distributed new sets of Desk-Benches and Teacher Tables under its School Support Programme to improve the overall learning experience for students in these schools. Going forward, Dabur plans to undertake complete revamp of the school infrastructure in Binapani Lower Primary School, Hasara Nepali Basti. The school support initiative is a result of detailed discussions with the school authorities and has been put in place keeping their specific needs in mind. “After detailed discussions with the school administration and local community members, we identify the need gaps in each school and then commence our development activities. Our intention is to develop and turn them into Model Schools for the region,” Ganguly said. In addition to improving school infrastructure, Dabur is also working towards women empowerment in the region through skill enhancement, besides undertaking plantation drives and spreading awareness in communities for improving health and hygiene.